On 14th of January, 2019, JIMS organised a guest session for PGDM Batch (2018-20) Sec B students looking for prospective career opportunities in the financial domain. 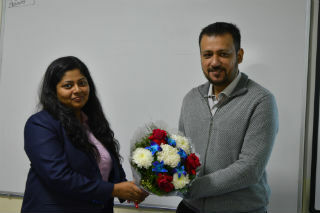 Mr. Prashant Kapoor, Vice President of Outlook Money was the guest speaker and facilitator who gave insights about various options available in the industry for students specialising in finance. He elucidated certain options and revealed how vast the financial industry is. 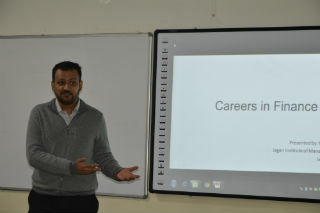 His experience of 13 years in the corporate sector was evident in the way he handled the queries of the students. Mr. Prashant Kapoor discussed in detail about public finance, corporate finance and personal finance as the potential career alternatives ahead for the interested students. A much more comprehensive discussion was held regarding investment banking, treasury, corporate development and financial management analysis during the session on request of the students. Mr. Prashant Kapoor not only advised students on job opportunities but also gave suggestions about relevant certifications which would be helpful for students desirous of joining the financial industry the next year. This session was held just when the students of PGDM are looking forward to apply for their summer internships giving them a first hand and genuine exposure to the possible options in the finance industry from an industry expert himself.